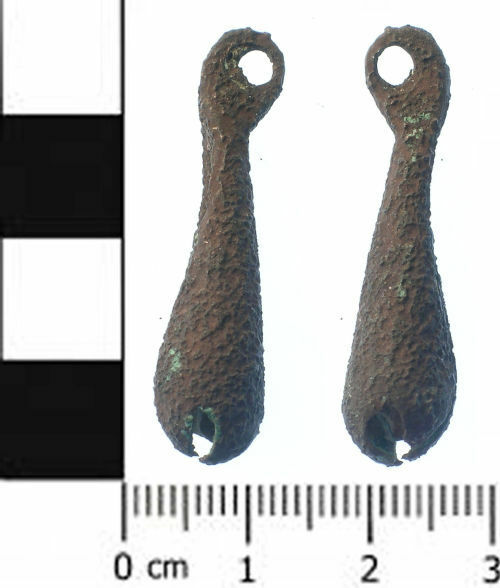 A sheet copper alloy, teardrop shaped bell dating from about 11300 - 1400. The suspension loop is flat and offset to one side. There is a seam along the back of the bell. The sheet has been rolled into a cone, and four pointed tabs at the base have been bent inwards to contain the striked, the slits betwwen them forming sound holes. A striker, triangular in section, remains in place, but has rusted and is inoperative. The bell is somewhat corroded. It is 35.7mm long and 9.1mm in diameter. It weighs 4.32gm. Many similar bells are recorded on the database, for example SUSS-A99234 and SUSS-3EDC42 which cites Read (2001) fig 37, no.464, who suggests a fourteenth century date.